How Often Should You Test Your Sump Pump? Sump pumps are absolutely crucial in some homes because they are used to stop water from building up in your basement. They work hard to move water away from the foundation of your home, moving it out from beneath your house and ensuring that your home remains free of water damage from outside sources, such as built-up groundwater or an abundance of rainwater. 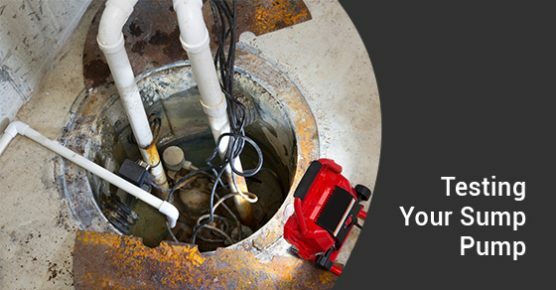 Because of the importance of sump pumps, it is crucial that you not only go to a trusted source for sump pump installation, but that you also have regular inspections and tests to ensure that it is working properly. You definitely do not want to be caught in a heavy rain without a properly functioning sump pump. How Often Should A Sump Pump Be Tested? Sump pumps require regular testing. How often you should test it varies depending on what your pump is used for. In most cases, sump pumps should be tested every three to four months. This should involve opening the inlet screen (often also called the pump screen) and cleaning it out, among other things. However, in some cases, your sump pump might actually benefit from more regular cleanings. In some houses, sump pumps are used to dispose of water from washing machines. This sort of water is soapy and grimy and can put additional strain on a sump pump system. If your sump pump is used to dispose of washing machine water, it is highly probable that you would benefit from more regular inspections. In such cases, it is often recommended that you inspect your sump pump as often as every month. If you are doing this, your sump pump can benefit from monthly inspections of things like the previously mentioned inlet screen, as well as checking the power cord and electrical socket for issues, but these inspections may not need to be as in-depth as those your pump receives every three or four months. What Should The Inspection Include? For more in-depth inspections, you will often want to go to a sump pump specialist, probably someone who does regular sump pump installation. For these inspections, you will want the professional to inspect the inlet screen. You will also want them to check the valve on the discharge pipe to ensure that no water is able to flow backward through the system. Because sump pumps are needed during severe weather, you will also want them to check that there is a sufficient backup power source. Finally, you will want the area around the sump pump inspected. The pit in which the pump sits should be inspected for size and depth, as well as for evidence that the pump is working well. And the discharge location should be inspected to make sure the system is draining properly. If you are in need of sump pump installation, call Advanced Plumbing at 877-286-8044 or contact us online here. We’re the plumbing experts. Advanced Plumbing offers efficient plumbing services and solutions, upfront pricing and 99.9% customer satisfaction.